We knew, when we saw a frog looking out from under a stack of roofing tiles, that we had done the right thing giving up snail pellets years ago. 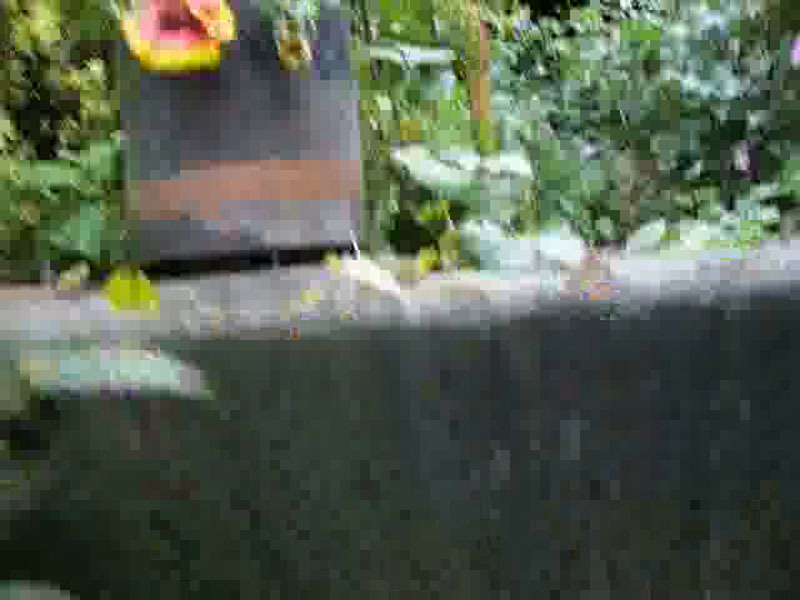 What a special guest in a small city garden! Where had this frog come from? Do any neighbours have a pond? The nearest known ponds are in Gillespie Park, 5 minutes’ walk away. Gillespie Park’s frogs had been keen to lay their frogspawn in the big pond back in March 2005, when I was one of many volunteers helping to relay the pond liner. The pond’s water had been drained before the protective butyl liner went down, but frogs were still hopping back to the pond of their birth from the rest of the reserve, & flailing about in the mud. To keep them from being covered by the pond liner, they were collected in buckets & carried back up to the small ponds behind the Ecology Centre. Surely no Gillespie Park frog had left the reserve, hopped along the pavement, crossed the road & somehow got into our enclosed garden area… Could wind & rain have blown it here as a tadpole? The tiles under which it rested were destined for the Recycle Centre, so we had to find some other shelter for our frog. We got a wooden Frog/Toad house. It had been on show in the Ecology Centre; when we saw it advertised in a catalogue for Garden Bird Supplies, we ordered it. Wood used in its construction is from forestry protected sources. It has two entrances, one with a wooden floor, one open to the soil with no floor. There is a terracotta tile in the roof. The tile is to be kept moist by watering the roof when there is no rain. Over this Des Res and its pond (a green casserole dish kept topped up with water) is a barrier of branches to deter cats & foxes. We are training climbers up this framework. Frog access to the Earthwork, their happy hunting ground, is only a few hops away. As we keep much of the garden leafy & overgrown, there are many places for frogs to keep cool & hide under vegetation. 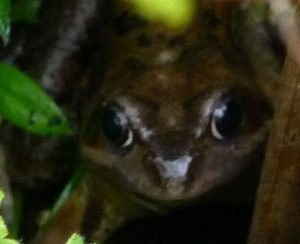 The frogs are silent, & a glimpse of one of them comes as a surprise & a treat. 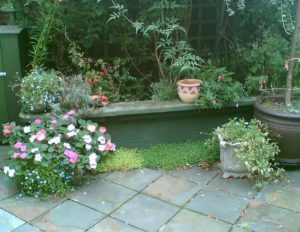 Green frogs have been seen in Baytree Corner by the blue egg water feature, on the earthwork, in the water of the casserole dish on a hot day & on the bank under cover of Persian Ivy. By the house, under the shade of the white table and hidden by pots, we have seen a larger orange frog, possibly a female. 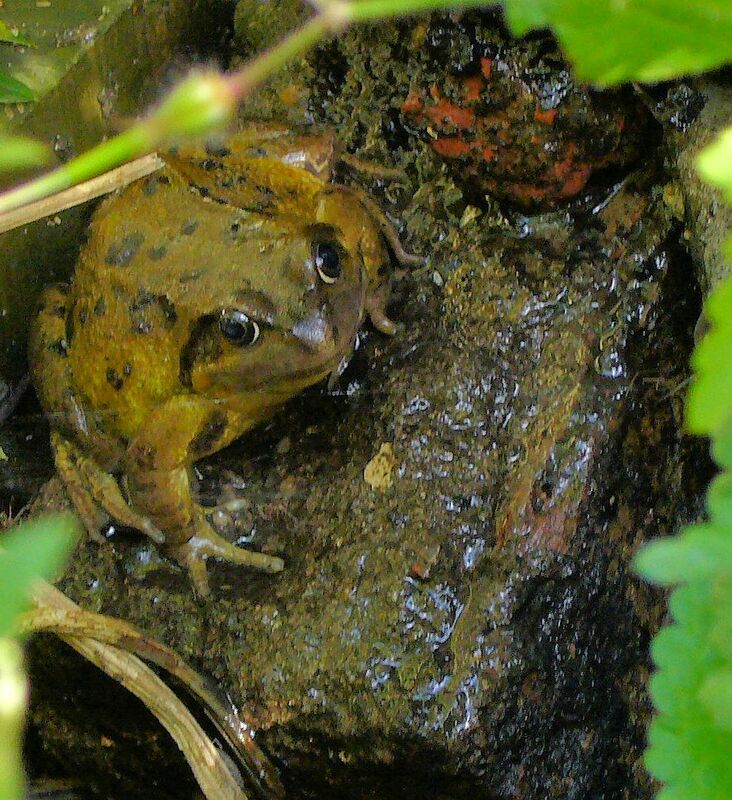 NOTE TO SELF – When weather is hot and dry, don’t forget to water the frogs! 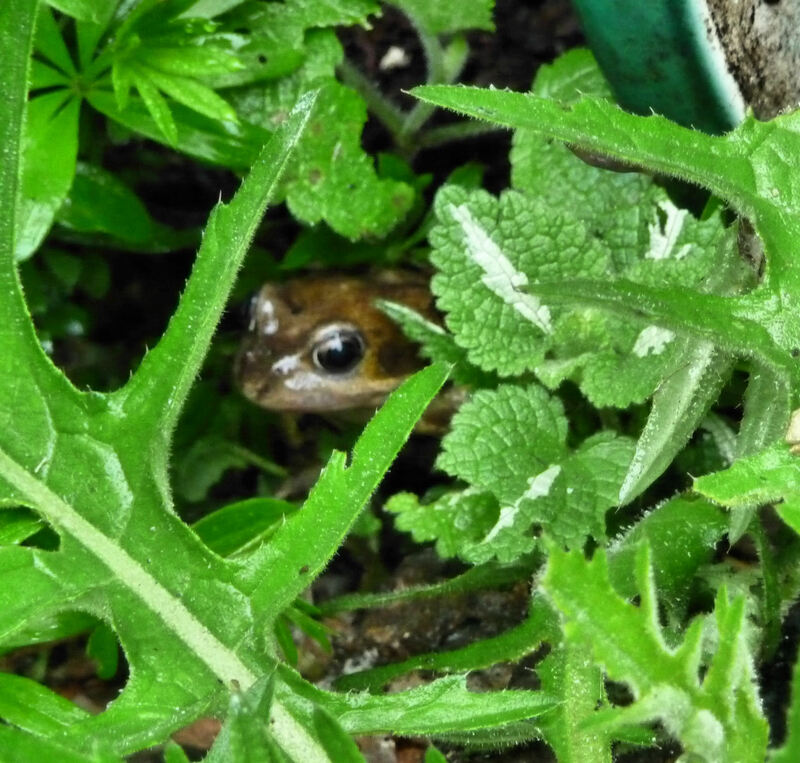 One morning as I stood on the path watering the flowers, a frog landed on my foot. It carried on hopping, probably as surprised as I was. I have only heard them once. 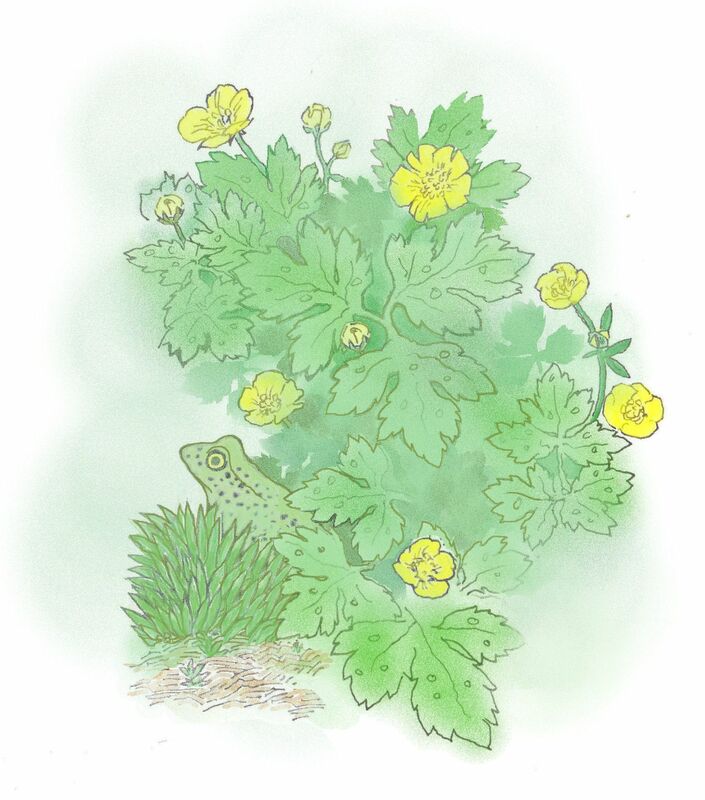 On a still, quiet day in the garden with no birdsong and little street noise, I was watering the flowers when a sudden deep, bass note rose from the Hardy Geraniums round the frog enclosure. It was a sound of only one syllable, that was… primordial. 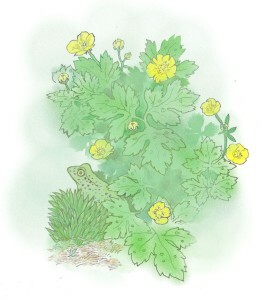 Something like ‘woarg!’ It was answered, half a moment later, by another ‘woarg!’ from the fern bed. Neither frog put in an appearance. The secret frog had been sheltering under the Betony, enjoying the shade. When the terracotta pot was turned, moving its shady side into the sun, the frog was suddenly out in the sunshine and secret no more. Sunshine on its skin was most unwelcome, and it hopped off. But not before the interfering human with the vidcam got a shaky memento of the occasion. Anne’s garden in Wimbledon is half the size of ours. 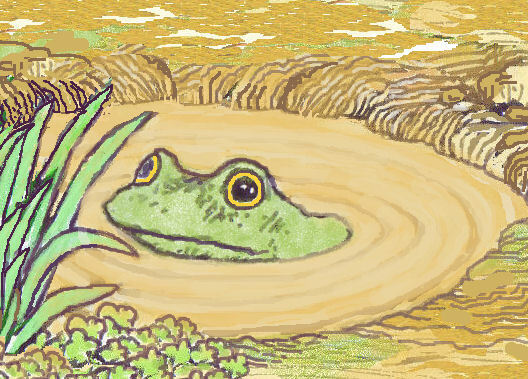 She has no idea where the nearest pond to her house might be, but her pondless garden has had resident frogs for years. 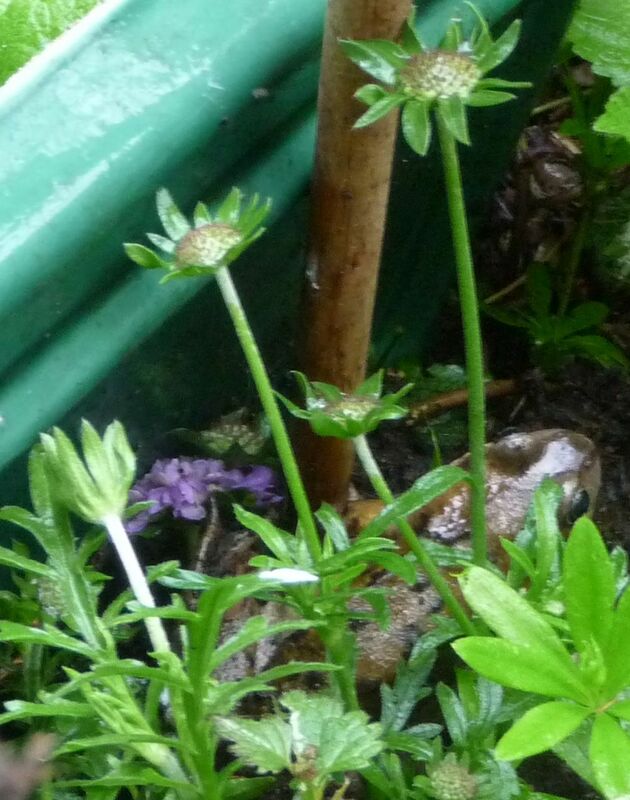 They have adapted to her many garden changes, camouflaged and staying moist behind pots, plastic bags & cuttings. As her assistant gardener, I would occasionally shift a pot or sack of something & a frog, sitting motionless, would be exposed. ‘Just look away’… said Anne. ‘When you look back, it will have disappeared.’ And this is what always happened. The frog made its getaway in total silence. It was as though an invisibility cloak had been flung over it. Our garden may be small. But if you are the size of a frog, it is somewhere you can make a living. As for those human giants that move through it, you have only to be still and wait until they move on. This next video, made by hopping the vidcam slowly up the crazy paving, is meant to show what a frog’s-eye view might be. 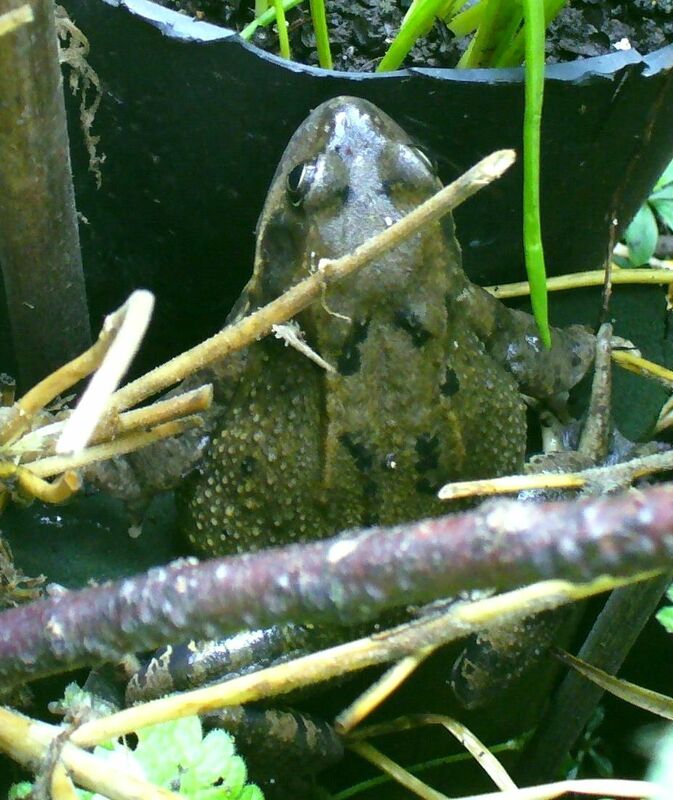 If you are thinking of having frogs in your garden, be encouraged. In at least two small, pondless London gardens whose humans were not too tidy & used no pesticides, frogs have made a life for themselves. 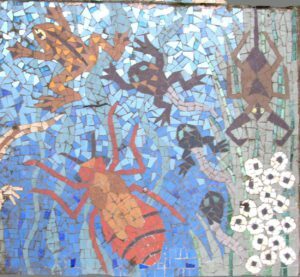 Question: How long have there been frogs in Highbury? 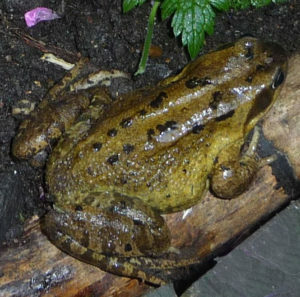 Frogs were so plentiful, in Islington and elsewhere round the country, that the marshy, boggy land they lived in might be named Frog Street or Frog Lane after them. Throughout the Middle Ages, London’s Frog Lane was the direct route from Clerkenwell to Highbury. Frog Lane in the Middle Ages: what would it have been like? Damp, soggy & squelchy, with mist rising from saturated ground & puddles to splash through… plantlife along the lane would have offered good cover for frogs as they sat, hidden & still, watching for worms, slugs, snails & insects. Some wildflowers, such as Creeping Buttercup, Purple Loosestrife & Ragged Robin would have flourished in the moist conditions along Frog Lane. Humans trudging along Frog Lane might not see or hear a frog at all for most of the year. 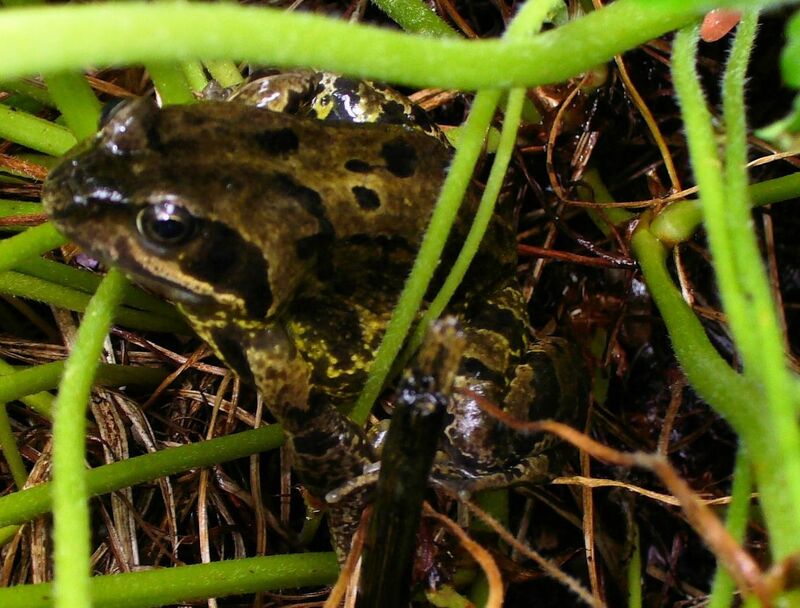 But in spring, at mating time, the lane would have thrummed with booming croaks as a RISING of frogs emerged from cover, a mass exodus of frogdom, hopping back to the pond of its birth. Horses, cows, carts & carriages would have used Frog Lane in the Middle Ages. On 14th July 1381, there would have been, as well, thousands of peasants squelching through the mud, slogging their way from the burning Priory at Clerkenwell to the Manor House at Highbury. A frog’s-eye view of the Peasant Revolt for those amphibians living here. Years passed. By 1735, Frog Lane was said to have three inns – The Chequer, The Flower Pot & The Fox and Cub. Between 1735 & 1746, there was also a Frog Hall (‘may have been a local nickname’); on its inn sign was a plough being drawn by frogs (!) By 1765, Frog Lane inns were The Rose, Barley Mow, Plough & Angel (Angler). Frog Lane’s surface was eventually changed. Boggy land was drained, houses built, streets laid out & covered with cobblestones, setts, macadam, tarmac. London’s Frog Lane was divided into segments, each of which got a new name. Frogs are in decline all over the world, and it is obvious that their soggy habitat is unwelcome to humans wishing to live close by. 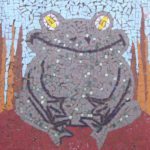 Whatever became of Frog Lane’s homeless frogs? 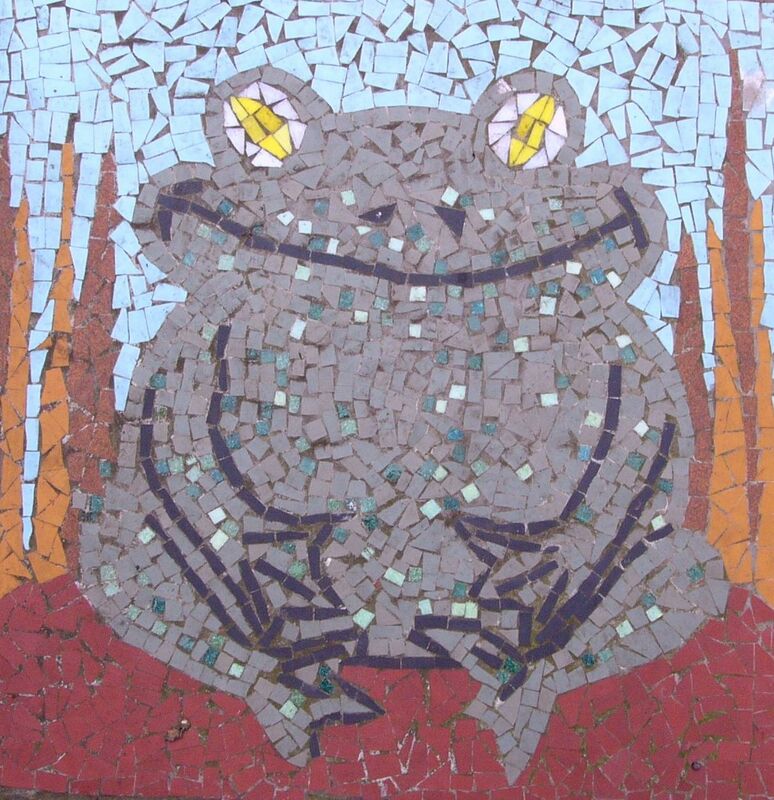 A number of cities, towns & villages across England had a ‘Frog Street’ or ‘Frog Lane’, including London, Sheffield, Trowbridge, Lichfield, Worcester, Bristol, Swansea, Minehead, Cannington & the Devon market town of Tiverton. In many case,s streets or lanes were located close to water – mill ponds, rivers or lakes. 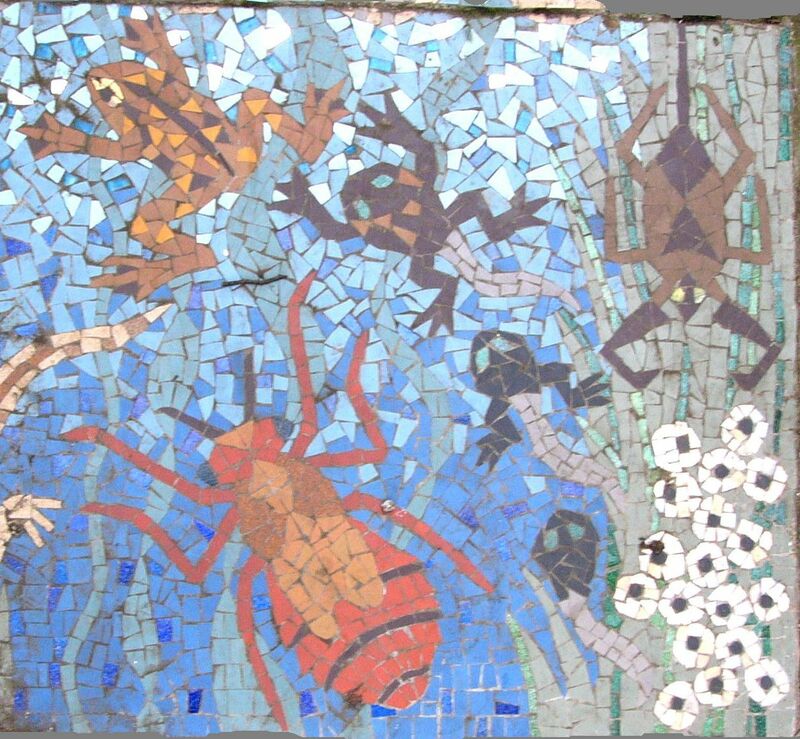 The earliest names (Froge mere St, Throgmorton St, Throgge Lane, Froggmorton Lane) incorporate the Middle~English words for frog and for marsh or mere and suggest an area of waterlogged land.